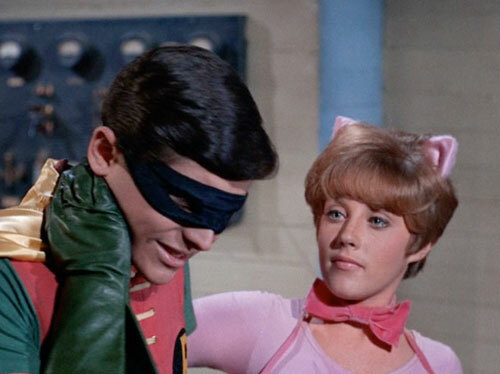 Lesley Gore assists Catwoman, and does a show-stopping performance — as in, bringing the story to a screeching halt — with her “California Nights.” She also administers “cataphrenic” to local-police-respecting Robin, making him into a cop-shoving, cliche-spouting hood! We talk about how Julie Newmar's portrayal (and Stanley Ralph Ross's writing) of Catwoman has changed since her season one appearance, Burt Ward’s punishment for complaining about his workload, more Gotham City Police incompetence, the show’s mucking with the formula (this podcast’s name is never spoken in this arc!) and more. PLUS: The Maxwell Davis version of the Batman theme, and a sampling of your voluminous bat-mail! AND! Help us discuss this draft of The Purr-fect Crime in a future episode! Write up your comments (or record them as an MP3 file up to one minute long) and send them to us (batpoles at deconstructingcomics dot com) by March 15, 2017!